There's a danger in reading online hiking reports - you just might be motivated to visit the exact same places. Such was the case last June, when a Portland Hikers contributor described a route near Mt Hood that traversed an ancient wagon road, ascended to a panoramic viewpoint, passed by two woodsy lakes, and finished with a return trip via the Pacific Crest Trail (aka PCT). Access was from Barlow Pass, a place I'd yet to visit. In keeping with my "try new hikes" summer goal, I immediately added this route to the following weekend's agenda. Hot weather was in the forecast, so I made sure to get an early start, arriving at the Barlow Pass Trailhead before 8 am. Although I've hiked from most of the trailheads near Mt Hood, this one had somehow escaped my attention. 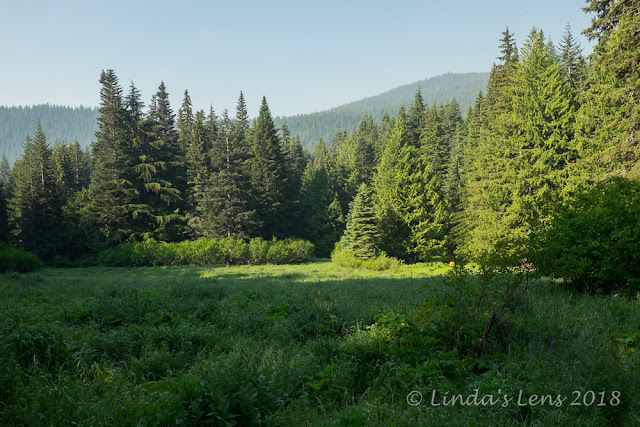 Being unfamiliar with the area, I had to do a bit of searching to locate the PCT, let alone the Barlow Road trail, my desired starting point. While puttering around the parking area, another car pulled up. Out jumped a man in running clothes. Turned out he was an ultrarunner visiting from Scotland, who had decided to get in a quick 30 miles on the PCT. After a bit of wandering we located both our desired trails. With that, I wished the man good luck, and we parted ways. My trail plunged downhill through a lovely old growth forest of Douglas Fir and hemlock. Early morning sunlight filtered through the thick branches creating stunning patterns. 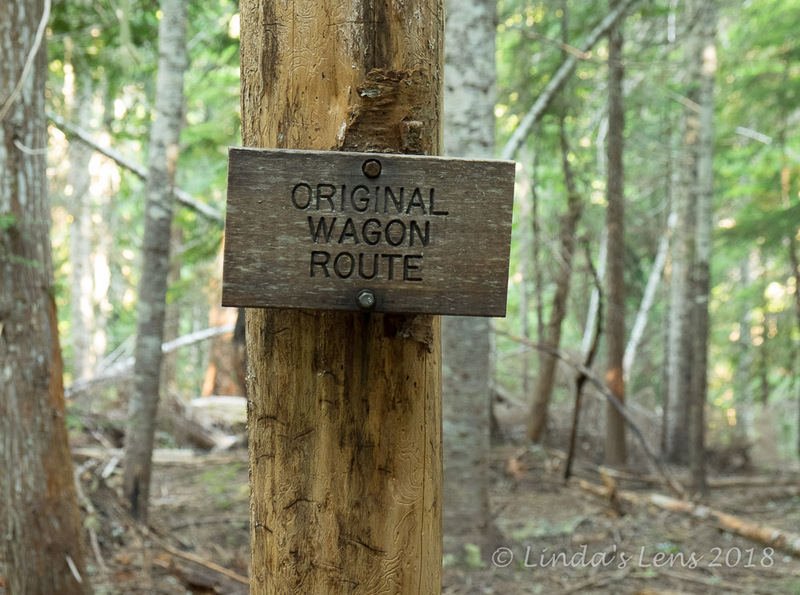 I noticed a couple of signs denoting the original Barlow Road wagon route. The Barlow Road was an alternate route for Oregon Trail pioneers to reach the Willamette River Valley (the other option being a dangerous float down the Columbia River). Online research mentioned pioneer artifacts had been unearthed from a nearby meadow. A short half mile ramble brought me to the wide open meadows of Devils Half Acre. The meadow was boggy and still wet with morning dew. A few tents were visible from a nearby primitive campground. Somewhere nearby my trail was supposed to intersect with the Palmateer View trail, which would then take me to Palmateer Point. Except that my current trail dead-ended in the meadow and the Palmateer view trail was nowhere to be found. I asked a couple camping nearby for directions, and they pointed me up a steep slope where I intersected with the rough gravel campground access road. Which direction should I follow this road - uphill or down? Thinking my trail junction was nearby I opted to hike up. I walked for half a mile with no sign of any trail. Another quarter mile with no luck made me realize I'd turned the wrong direction. But I wasn't about to retrace my steps now (there was no guarantee the trail would be the other way) so I kept following the road until it deposited me back at Barlow Pass, right where I'd started! Time for plan B. Consulting my map, I found the PCT would also take me to the Palmateer View Trail. It meant a bit more mileage, but at least I'd be following established trails. Opting for the sure thing, I started again, this time following the PCT southbound. The PCT was wide and well-graded, if not a bit of a steep climb. A mile of uphill huffing brought me to the junction with the Palmateer View Trail. Finally we meet! The trail then descended steeply, losing all the elevation I'd gained and more. In winter months, all the trails in this area are used for skiing, and I couldn't imagine traversing down this path on skinny cross country skis. 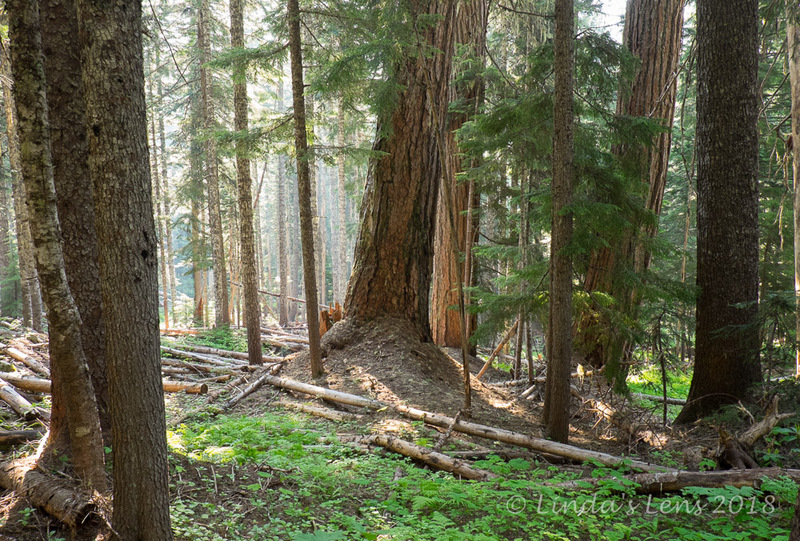 The forest was especially beautiful here, with more majestic tall firs and a few pines mixed in. 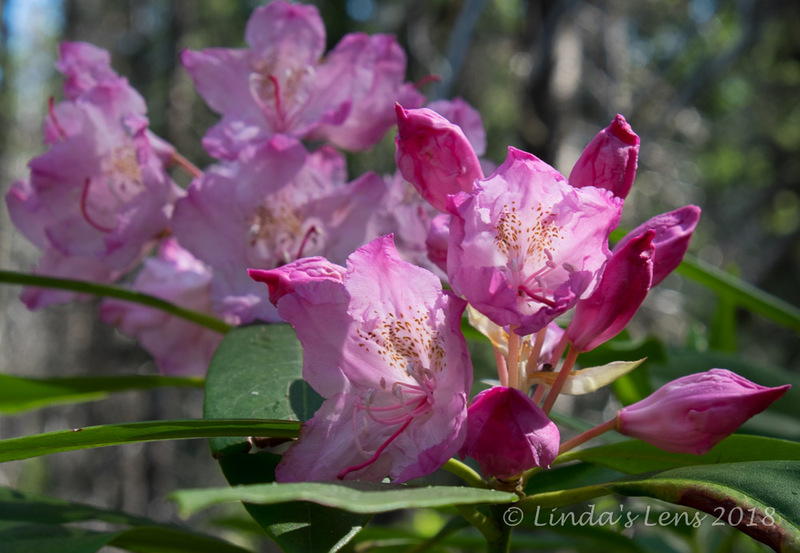 I even found a few bushes showing the last of the rhododendron bloom. 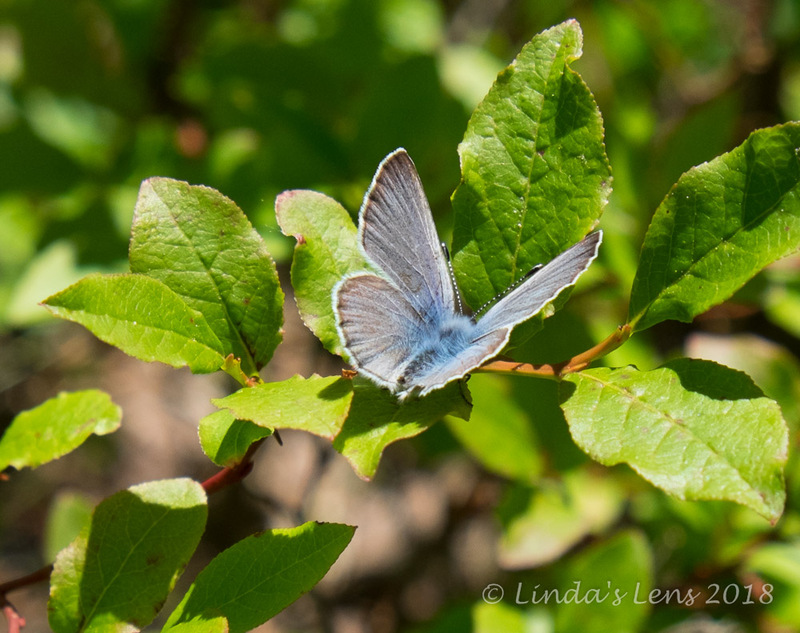 Several lovely blue butterflies floated in the breeze, and I was lucky enough to capture one with my camera. Then I came upon an unmarked trail junction. Judging by the distance I'd traveled since the PCT, I was pretty sure this was the path to Palmateer Point. 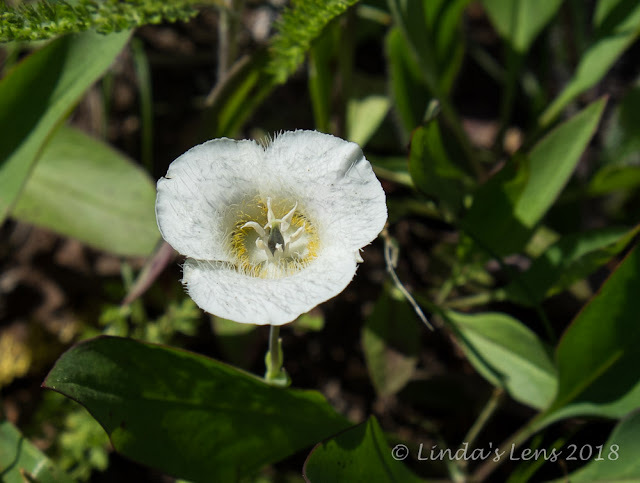 I climbed steeply up a knoll and traveled across an open ridge lined with hundreds of creamy white mariposa lilies. 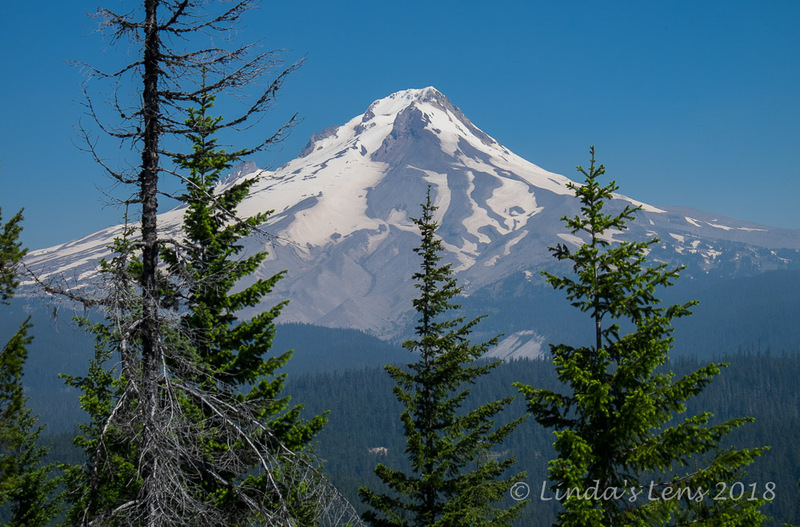 And there at the very end was Palmateer Point with it's killer view of Mt Hood. Early morning light lit up the mountain perfectly. If not for a few tall trees blocking Hood, the view would've been picture perfect (although it still wasn't too shabby). I wandered along the ridgeline's very edge, clicking my camera shutter, vying for the best image. My early arrival meant I was lucky enough to have Palmateer Point all to myself the entire time. After a good half hour of gazing at the mountain, photo-taking, and a quick snack, I was ready to continue the day's trek. Voices from nearby hikers coming up the trail hastened my departure. From Palmateer Point it was a quick mile and a half ramble to the first of two Twin Lakes. It was on this trail that I began to run into other hikers. The Twin Lakes, Upper and Lower, are popular destinations so I wasn't all that surprised. Upper Twin Lake totally charmed me. A tiny bright blue water body, it sparkled in the sunlight. 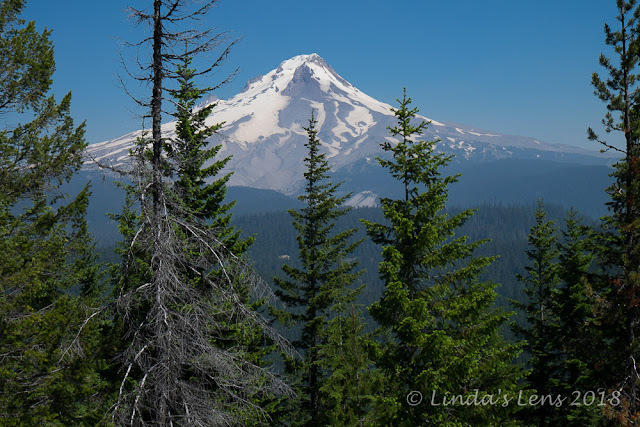 Mt Hood's very tip rose above the adjacent forest. Stopping for a break, I was pulling a snack out of my backpack, when who should come bounding out of the forest than the Scottish runner I'd met at the trailhead. 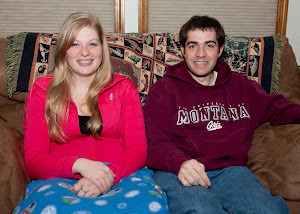 So funny to run into him for a second time! We both instantly recognized each other and chatted for a few minutes about where we'd been hiking (or in his case, running). I took a couple photos of the man in front of Upper Twin Lake and then we said our goodbyes once again. 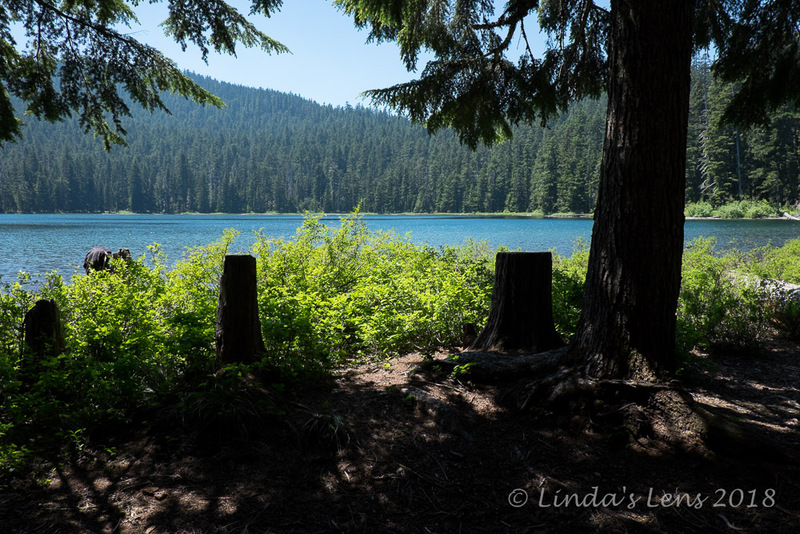 Another 3/4 mile downhill trek brought me to Lower Twin Lake. Unlike it's upper cousin, the place was swarming with people. 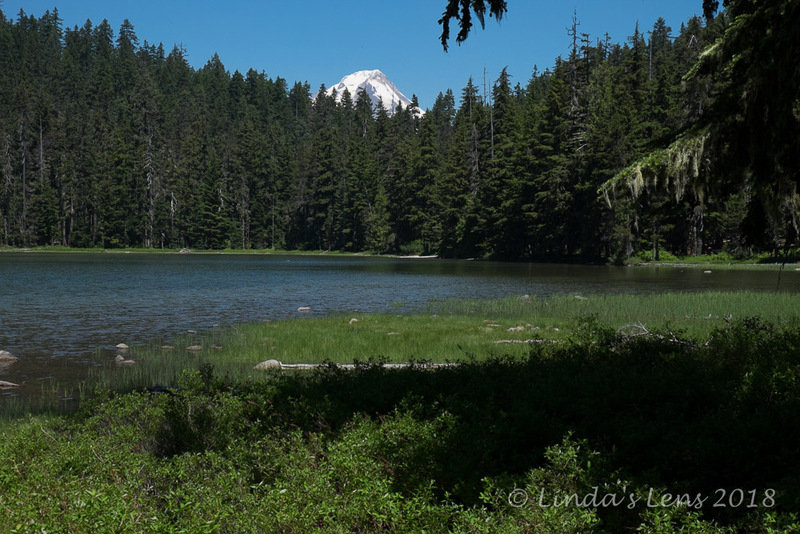 A mere two-miles from the Frog Lake Trailhead, this lake was a popular destination for backpackers and day hikers. Several groups had tents set up nearby, while a few others were sitting on the lakeshore, skipping rocks, swimming, or just enjoying the view. Needless to say I didn't linger. What goes down must come back up, so I climbed a steep 3/4 mile path that connected back to the PCT. From here I had a 3.5 mile march back to Barlow Pass. This stretch of the PCT wasn't the most interesting, so I put my head down and tried to cover ground as quickly as possible. The mid-afternoon heat didn't help, so this leg was long, dusty and hot. As always, it was a relief to finally glimpse the parking lot back at Barlow Pass. Another new trail checked off! Although I'm glad to have explored this area, I don't know that I'd do it again anytime soon. But it was good for 12 miles and a couple thousand feet of elevation gain on a sunny summer's day. Funny that you met the runner again. Looks like a lovely area! Magnifica esta caminhada por esta bela montanha. ...I often wonder how they got wagons through this roughed country. 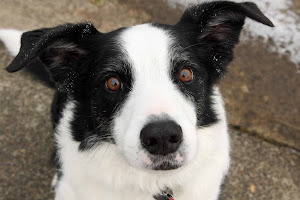 Hello, I have a long list of trails to hike just from your blog. This hike has beautiful views of Mt Hood and the lake. Pretty flowers and butterfly. 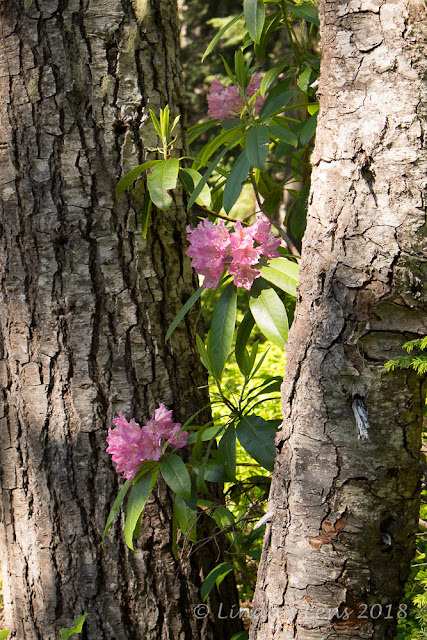 Lovely photos and a great report on your hike. Happy Friday, enjoy your day and weekend! I'm not a fan of poorly marked trails. You can waste a lot of good time and there's the possibility of being lost. anyway you ended up having a very good hike. Your adventures are always so interesting. And your images never fail to impress. That blue butterfly is so beautiful! Killer view of Mt. Hood is right...that's a wall hanger. 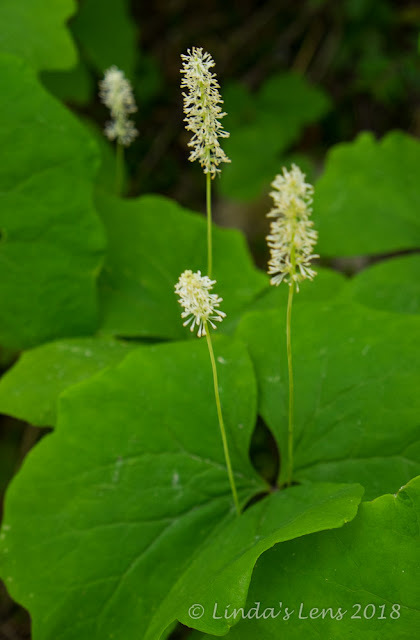 Wonderfultoseethe wildflowers butterfly and that magnificent snowed cappped mountian on the trail. Have a great weekend Linda. Beautiful mountain scenery. Funny thing about ultra runners/ultra walkers is I used to follow quite a few of these blogs in passing years ago and some are still going but more have packed in due to body parts breaking down 5 or 10 or 20 years later. Not always a healthy long term option. Gosh that is such beautiful country!!! Thanks for sharing your hike! and ha ha - a quick 30 mile run? I;d still be running!!! 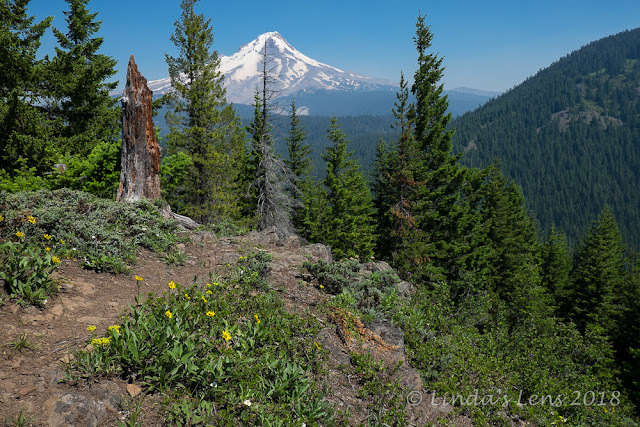 For the reader your images of Mt Hood and the wildflowers definitely make it a worthwhile hike. Hi! I enjoyed your beautiful photos very much. As the proverb says The early bird catches the worm. Your early start was very nice. Thanks for sharing. 12 miles! Wow! 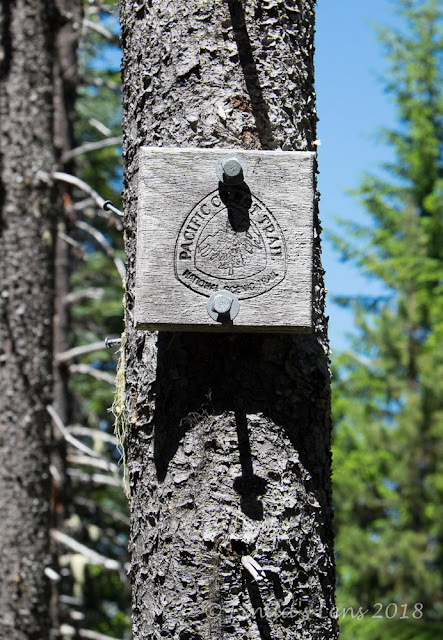 We camped up here a few years ago, and I remember having the Barlow Trail Burger (Swiss cheese and bacon) :) at a local grill, but we stuck to the familiar (and much shorter) trails. Looks like a beautiful and ambitious day hike that you pieced together. Such gorgeous views of Mt Hood and that blue butterfly was so precious! Sometimes trails can be hard to follow when they aren't well traveled, I'd be worried about getting lost. 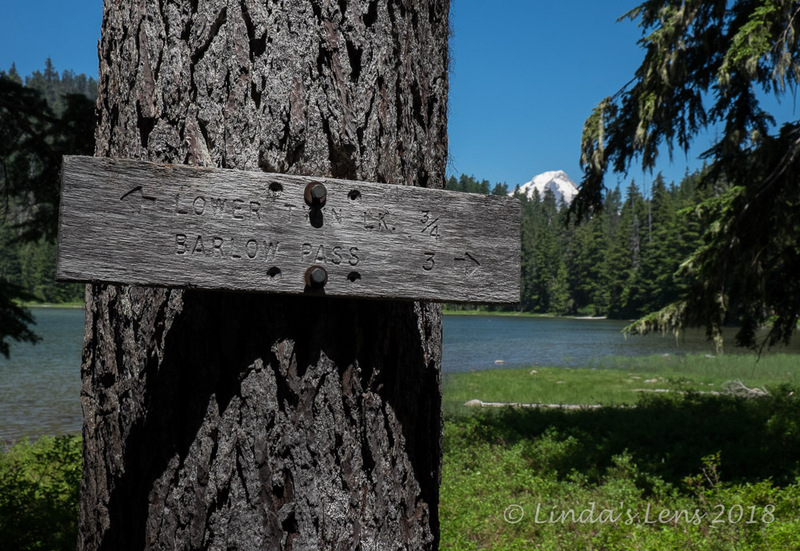 hiking 12 miles on a hot day is so remarkable--good job, Linda! I know I've been on at least part of your hike! I'm curious if you are doing anything differently after the mountain lion attack near there.